Late last fall we built a deck on the back of our home, it has just been sitting there waiting to get used. I’ve been so excited for the weather to warm up so I could get at it. The first up was to add some pretty flowers, and after finding some cute dollar store plant pots, I knew I wanted to create a DIY planter for flowers. The best way to get motivated to start working on projects for our back deck was to join some of my blogger friends in an Outdoor Extravaganza! You may remember back at Christmas when I participated in the One Item Challenge, this idea is similar where each week we will have a theme to kick off our outdoor ideas. Big thanks toSatori Design for Living for hosting! This week the task at hand is Plants and Flowers- how suiting! Aren’t these little plant pots I found at Dollaramma the cutest? and only $2 each! I knew I had to find a way to incorporate them into a planter design. You’ll have to forgive me for the crazy angle, stick drawing above, I totally forgot to take process photos (silly me). 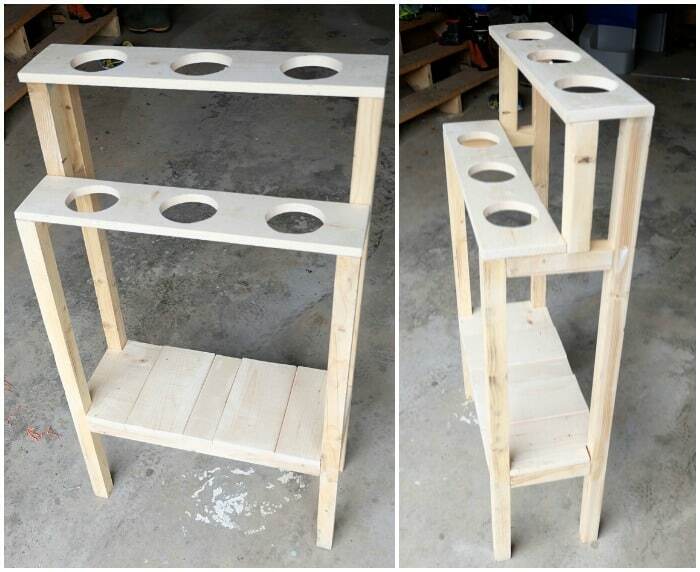 Assemble each side of the DIY planter as shown in the first figure. The height of the bottom shelf, is 11″ from the ground. Using a generous amount of Gorilla Glue on each joint, and brad nailing (or screwing if desired) a few times in to each joint. Create a circle template in proportion to the size of your flower pots. *Tip- to find the appropriate size of circle, wrap a piece of string around the place on the planter where you would like them to fit into. Then use the string to measure around a circular object for tracing. 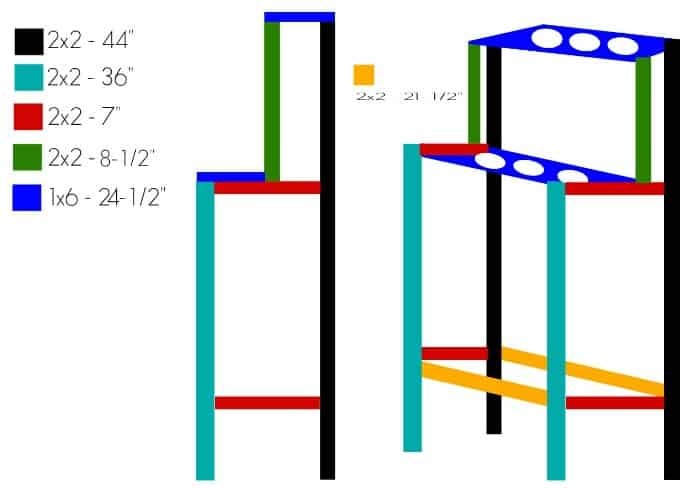 Attach the two side pieces in figure 1 together with the 21-1/2″ 2×2’s (shown in orange), Then stabilize with the 1×6’s on the top. Now that the frame is built you can piece the shelf together using the remaining pieces of 1×6. Notch out the boards for the ends by tracing the 2×2 in the corners of two boards. Paint with desired color. I used Swan Lake 201-2 from Voice of Color in Exterior Manor Hall Flat finish. 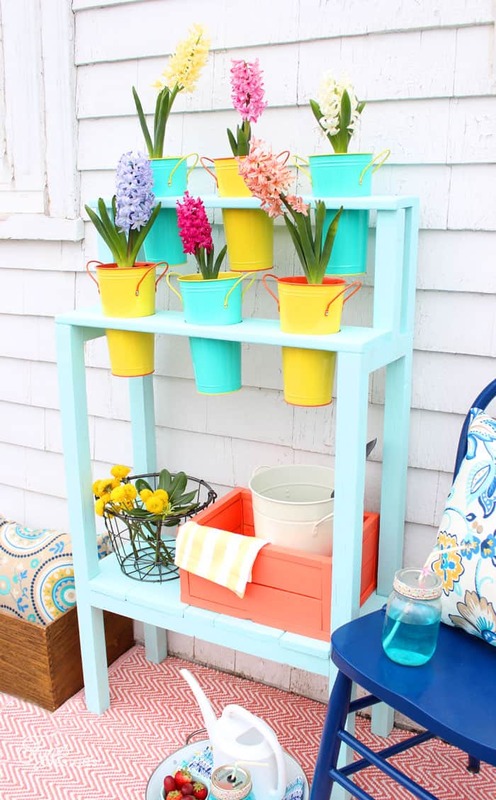 You should be able to whip together this cute outdoor planter in no time at all! Choosing the plants to fill the flower pots is the best part! I chose colourful hyacinth bulbs. I know they won’t last through the summer, but once the blossoms fade I’ll plant the bulbs in the backyard and choose something that can waterfall out of the pots. 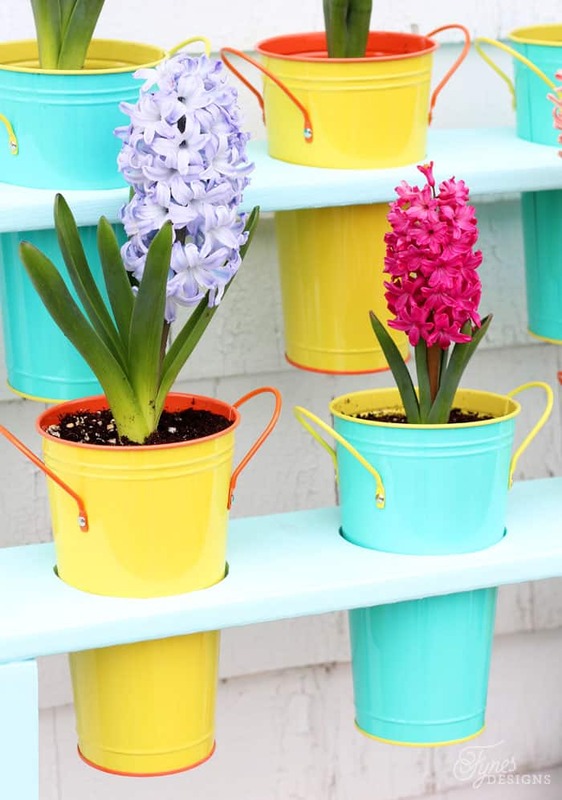 I can’t get enough of these cute flower pots, they make me smile from ear to ear! Could this color scheme be any more happy? I love how the Coral Silk crate compliments this little deck planter too! You might remember that Blue Tang chair from the Patio Furniture Makeover I did last summer. The leftover piece of fabric from the kitchen makeover really ties all the colors together so well (or it might be telling me something else about my color choices?!). Thanks for joining me today to check out this easy to build DIY planter, I hope the sweet flower pots left you smiling. Disclosure: The paint for this project was provided by PPG Voice of Color. All ideas, projects and opinions are my own. Follow Virginia | Fynes Designs’s board Deck Ideas on Pinterest. 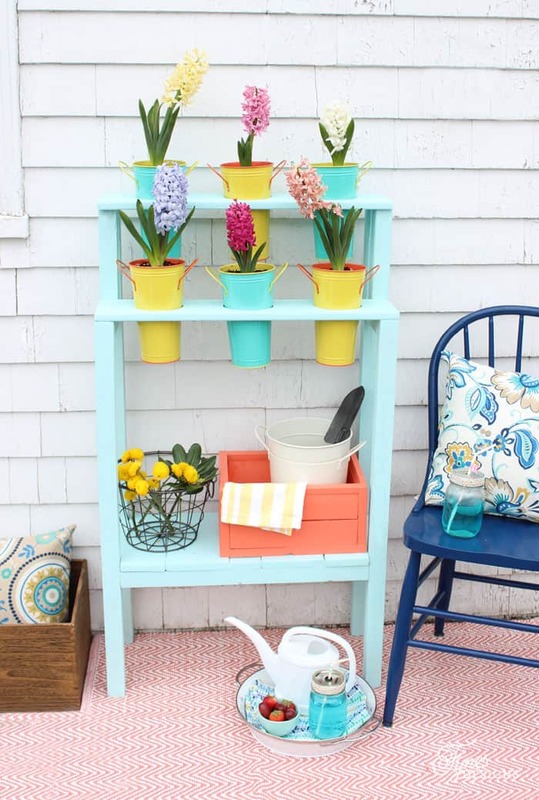 Love how bright and cheery your planter and flower pots look. Perfect for spring and summer. Glad to have you on board once again! This is such a cute little flower cart Virginia- I love the little buckets. I have seen those same ones at my local dollarama – I think I need to pick a few of them up, now! Love the whole colour scheme:) Right up my alley! Absolutly adorable! I am crazy for all the bright colors! What a great idea – LOVE the colors! I just spent the weekend planting flowers and veggies and wish I would have had something like this. 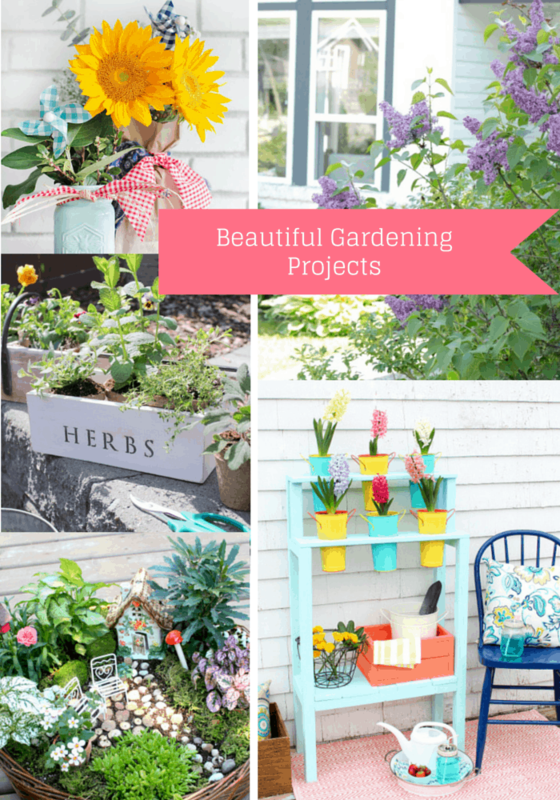 Maybe I’ll still make it and get some more plants 🙂 Super cute project! Oh wow! This is beautiful and so colorful and cheery. I would love to make one of these. I’m pinning this for later. love all the color this brings to your space! enjoy. This is absolutely beautiful. Love it. Great work 🙂 Pinned because it deserves to be shared. Stopping by from the Ladies Collective linkup, have a nice week! Thanks for visiting, I loooove color!! beautiful! thanks for sharing the diy. 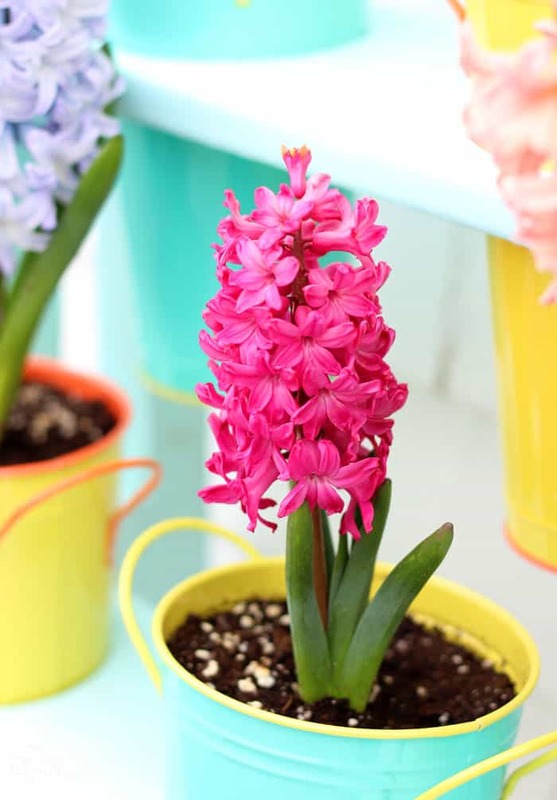 great idea for the planters too – move the bulbs and plant something new as the year progresses! thanks for sharing with us at Snickerdoodle! I’m dropping by from the Live Laugh Rowe link party. I absolutely adore this planter! It is so stinkin’ cute! And those colorful pots. I wish I had several dozens of them on my patio! I’m trying to grow my own link party. I invite you to share this idea (and 2-3 more) at my Grandma Ideas Sharing Time link party at http://grandmaideas.com/grandma-ideas-link-party-17. I think that my readers would really enjoy your idea. You are such a talented person! This is so cool! I think it would fit in my tiny apartment patio. I love your patio, it’s so cozy and colorful! Love the color you chose for the planter. This is very pretty! And very Spring like! I found your post at Small Victories Sunday Linkup. Absolutely adorable!! And those cute little planters are totally what drew me to your post. 🙂 The colors are perfect! Featuring this at Motivational Monday tomorrow night. 🙂 Hope you’re having a great weekend! Cute cute cute! 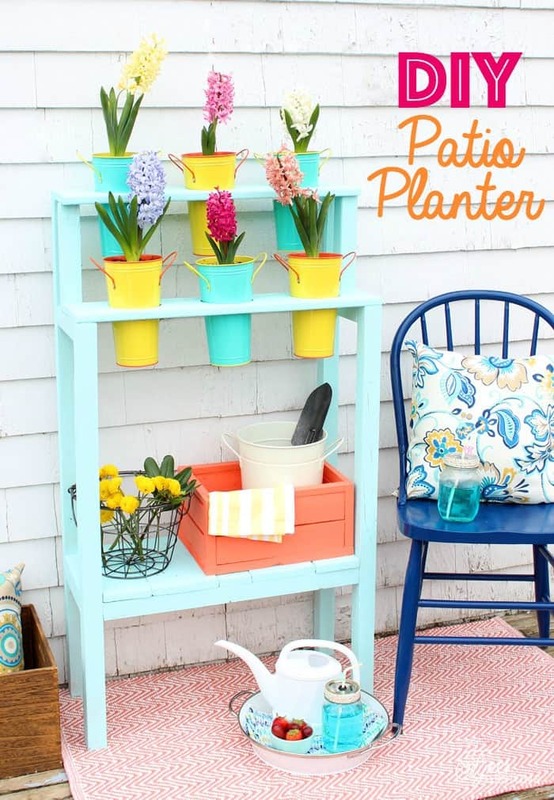 I love this planter and the beautiful colors of your outdoor space! Amazing photos!! Thanks for sharing with us at the Home Matters #homematters Linky party. We hope you join us again! That is so cheery! I love the colors! It really brightens things up!